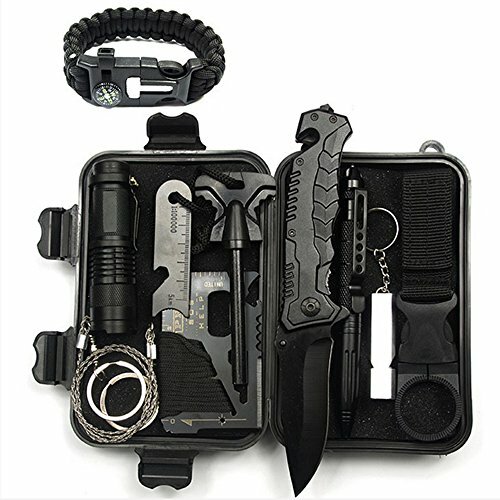 This enhanced version of the 10-piece suit adds a modern utility line saw, multi-function bracelet and water bottle hang buckle that can match the backpack MOLLE system on the basis of the original survival box. It is more collectible; The tying knife card strengthens the functionality of outdoor survival. The living tools for storage are versatile, and there are dozens of functions in a few simple tools to meet the various needs encountered in the outdoor survival process. 【Compact & Portable, Easy To Carry】-- We've Packed This Kit Into A Super Compact Lightweight Ultra-durable Portable Tool Case, Filled with Sponge, Waterproof and Shockproof. Dimensions is 6.8*4.2*2 Inch and Weight Only 17 Oz. So Easy To Carry, Can be Placed in A Backpack, Cars, Pockets, Drawers, Hiking or Camping Gear. You can Take it Anywhere You Go! High-Quality Cold Steel - Cold Steel Military Knife, black cold steel blade, and black aluminum handle. Anti-Rust, Durable. Coming with Waterproof Protective Case and A User Guide. Perfect Gift - A Cool Gift to you brother or friends. And also can develop child's survive and handmade ability. It's necessary when camping, hiking, Climbing,adventures, it can help you make a life guard in extreme situations. If you have any questions about this product by ZTZ, contact us by completing and submitting the form below. If you are looking for a specif part number, please include it with your message.